Tutankhamen’s mysterious death as a teenager may finally have been explained. The condition that cut short the Egyptian ruler’s life may also have triggered the earliest monotheistic religion, suggests a new review of his family history.Since his lavishly furnished, nearly intact tomb was discovered in 1922, the cause of Tutankhamen’s death more than 3,000 years ago has been at the center of intense debate. There have been theories of murder, leprosy, tuberculosis, malaria, sickle-cell anemia, a snake bite — even the suggestion that the young king died after a fall from his chariot. (Andrew Holt/ALAMY) – A srugeon in Britain argues that features of Tutankhamen’s body may help explain why the boy king died while still a teenager. But all of these theories have missed one vital point, says Hutan Ashrafian, a surgeon with an interest in medical history at Imperial College London. Tutankhamen died young with a feminized physique, and so did his immediate predecessors. Ashrafian found that each pharaoh died at a slightly younger age than his predecessor, which suggests an inherited disorder, he says. Historical accounts associated with the individuals hint at what that disorder may have been. “It’s significant that two [of the five related pharaohs] had stories of religious visions associated with them,” says Ashrafian. People with a form of epilepsy in which seizures begin in the brain’s temporal lobe are known to experience hallucinations and religious visions, particularly after exposure to sunlight. It’s likely that the family of pharaohs had a heritable form of temporal lobe epilepsy, he says. This diagnosis would also account for the feminine features. The temporal lobe is connected to parts of the brain involved in the release of hormones, and epileptic seizures are known to alter the levels of hormones involved in sexual development. This might explain the development of the pharaohs’ large breasts. 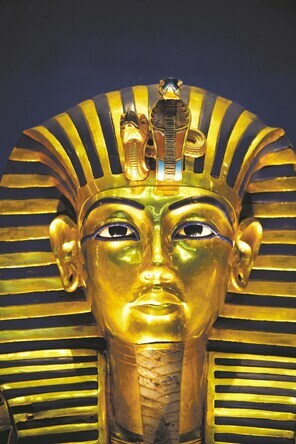 A seizure might also be to blame for Tutankhamen’s fractured leg, says Ashrafian. Tuthmosis IV had a religious experience in the middle of a sunny day, recorded in the Dream Stele, an inscription near the Great Sphinx in Giza. But his visions were nothing compared with those experienced by Akhenaten. They encouraged Akhenaten to raise the status of a minor deity called the “sun-disk,” or Aten, into a supreme god — abandoning the ancient Egyptian polytheistic traditions to start what is thought to be the earliest recorded monotheistic religion. If Ashrafian’s theory is correct, Akhenaten’s religious experiment and Tutankhamen’s premature death may both have been a consequence of a medical condition. “People with temporal lobe epilepsy who are exposed to sunlight get the same sort of stimulation to the mind and religious zeal,” says Ashrafian. “It’s a fascinating and plausible explanation,” says Howard Markel, a medical historian at the University of Michigan in Ann Arbor. However, the theory is almost impossible to prove, he adds, given that there is no definitive genetic test for epilepsy. Orrin Devinsky, a neurologist at New York University’s Langone Medical Center, says the theory must remain speculative.